As expected, Apple has just officially announced two new generation of its iPhone offerings, the iPhone 6s and the bigger sibling iPhone 6s Plus. In terms of screen sizes and physical design, they are basically the same as last year's devices. However, if we take look on the inside, there is where most of changes and enhancements take place. In other words, the iPhone 6s and 6s Plus are the same familiar bigger iOS-powered smartphones we knew and loved but with more powerful features and functions. Just a quick recap, the iPhone 6s sports the same 4.7-inch Retina display and the iPhone 6s Plus is at 5.5-inch Retina Display. These two devices now come in new color option called the Rose Gold, that's in addition to the existing Space Gray, Gold and Silver. The casing is now made out of 7000-series aluminum alloy, which Apple says the same type of metal used in aerospace industry. This being said, we can expect the new iOS smartphones to be bendable no more as what happened with some units on last year's iPhone 6 and 6 Plus. Not to mention the new type and stronger glass Apple implemented on the front panel which is called the dual ion-exchange glass adding more protection to the screen more than ever before. 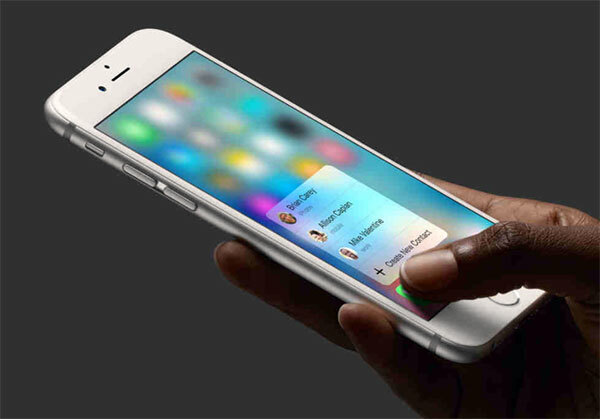 There is a new multi-touch technology Apple has introduced with these new phones and they call it the 3D Touch. It's quite technical to explain but what it exactly does is it's adding another layer of touch sensor layering behind the screen which enables users to "peek" and/or "pop" an app's content without leaving the current display they are on by simply soft touching a 3D Touch-supported app. With a light press on the screen, users will have a "peek" on the content and if they want to see the whole thing and launch the app, for example an email, they just have to add more pressure to the screen and they will be brought inside the app and interact more, this is called the "pop". It's not just peeking at content, it also allows user to pop out menus of an app without even launching the whole application. The camera app for example, soft touch it and it will show users options like Take Selfie, or "emergency selfie". 3D Touch is integrated in all iOS 9 apps, third party apps will have this option to add to their iOS apps too. During the live demo, Facebook and Instagram were some of the third-party apps used for this new technology. The Apple iPhone 6s and 6s Plus feature new processors. The A9 and it's motion co-processor M9, Apple said these new chips are up to 90% faster than the previous models. If you have been following Apple's way of unveiling new products, they really never tell exact specifications but more of comparing them with previous generations to show how much improvement they have done with the newest models. Fortunately, Apple mentioned the exact number of pixel they have on these new iOS devices, the rear iSight camera now sports 12MP (an upgrade from 8MP from previous installments) and more high-end camera technologies to make sure that captured photos will produce with true-to-life colors and more detailed images than any iPhone or smartphone has to offer. Phil Schiller, while introducing the new iPhones, mentioned that they were able to add more resolution to the camera sensor without compromising the quality of pictures iPhones have been generating, they call this new technology "deep trench isolation", more light are captured yet still avoiding noise penalty in photos, and colors in the pictures are seen as they are in reality. Another new feature Apple introduced is the Live Photos, this works like a gif image in some sense. This feature give life to the photos taken, where the sensor or camera starts taking images from 1.5 seconds before and after pressing the capture button. It's not a video, Apple said, it's live photos and when users look at the camera roll, they will immediately distinguish whether an image is a live photo or a video. All iOS 9 and El Capitan (for Mac) running devices will be able to enjoy this feature. At the event, US pricing was only announced. The iPhone 6s and 6s Plus will be released in select countries on September 25. Hopefully the Philippine release will not that far away. We will definitely know when these new devices will be available in the Philippines in the coming days or weeks, so stay tuned.